Since I spent most of the weekend working I did not have a chance to do any posting on here. However I did find the time to try out some new snack recipes that I had been wanting to make for a while and we all sat down and tested them out last night to see how they were. This first one I think was the real hit and turned out the best. 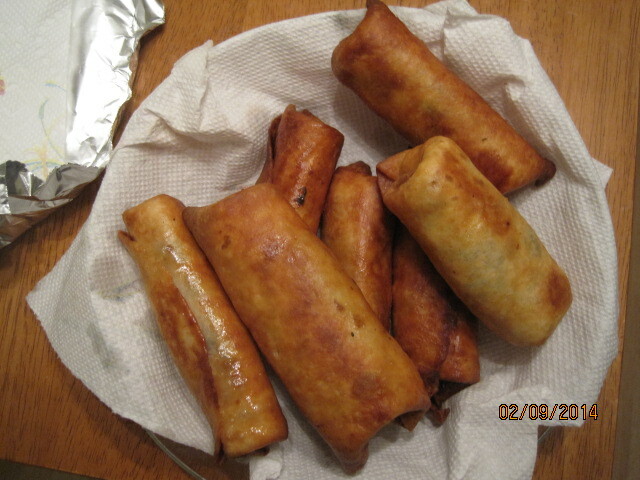 It is a take on Chili’s Southwestern eggrolls recipe. If you have ever eaten at Chili’s or many other places just like it now, you have likely seen this one listed on their menu and perhaps have tried it out. It has always been one of Michelle’s favorites and when I came across it at Chef’s Catalog website I knew I had to give it a try and see how it was. Though they might seem complicated to make, they are actually pretty easy and I think worth the time to put into it. Heat a large skillet over high heat with 1 tablespoon of the vegetable oil until it is shimmering. Saute the chicken breast until it is cooked through, about 4 to 5 minutes per side. Set the chicken aside until it cools down enough for you to handle. Wash and dry the skillet to use for the next step. In the now-empty skillet, heat 1 tablespoon of vegetable oil over medium-high heat until it is shimmering. Add the red pepper and the green onions and saute for 2 to 3 minutes until the vegetables are tender. Dice the cooked and cooled chicken into small cubes and add it to the pan. Add the frozen corn, black beans, spinach, jalapeno peppers, parsley, cumin, chili powder, salt and cayenne pepper to the pan and mix thoroughly. Saute the mixture until it is heated through, about 4 to 5 minutes. Stir the mixture well so that the spinach breaks up and is incorporated into the mixture. Remove the pan from the heat and add the Monterey Jack cheese. Stir until the cheese has melted into the mixture. Wrap the flour tortillas in a moist cloth and microwave them on high for 1 1/2 minutes or until they are hot. Spoon approximately 1/5 of the mixture into the center of a warm tortilla. Fold in the ends of the tortilla and then roll the tortilla over the mixture. Roll the tortilla very tightly but before you finish rolling brush some of the beaten egg on the inside edge of the tortilla. Finish rolling the eggroll, then set the eggroll with the “glued” seam facing down until the egg sets. Repeat the process with the remaining tortillas and filling until you have five large eggrolls. Arrange the eggrolls on a plate with the sealed edges facing down, cover the plate with plastic wrap and freeze for at least 4 hours or overnight. While the eggrolls freeze, prepare the avocado-ranch dipping sauce by combining the avocado, mayonnaise,, sour cream, buttermilk, white vinegar, salt, dried parsley, onion powder, dill weed, garlic powder and pepper in a small bowl and mixing until everything is well combined. Refrigerate the dipping sauce until you are ready to serve the eggrolls. Preheat the 6 cups of vegetable oil in a deep cast iron pan or Dutch oven until the temperature reaches 350 degrees. Deep fry the eggrolls, in batches if necessary, in the hot oil for 8 to 10 minutes until they are golden brown. Remove the eggrolls to a paper towel-lined plate or a cooling rack to drain for about 2 minutes. Slice each eggroll diagonally lengthwise and arrange them on a plate around a small bowl of the dipping sauce and serve. Just a couple of quick notes about this recipe. If you don’t want to use the jalapenos, leave them out. I didn’t have any on hand when I made them and the final results were fine, but if you want more heat put them in. Also, I never use as much oil as they recommend when deep-frying. I just hate using that much oil and I try not to deep fry very often, but for something like this I think they came out much better than if we tried them in the oven first. We all loved the results of this recipe. It tastes a lot like what you get at the restaurant and was not hard to make at all. Letting them freeze really does help things to set up nicely and you get a nice dark color when they are deep-fried because of it, but to be honest I only froze them for a little over and hour and I think they turned out fine with that little time. Five may not sound like a lot to get but they are a decent size. If you are making these for a crowd you may want to make a double batch, though I actually got 7 out of the filling I made, so it really depends on how you want to go about it. Michelle has always loved the avocado ranch sauce they serve and this home version did not disappoint. It has the nice mix of flavor you like in the sauce and is perfect not just for egg rolls but for anything else you may want to dip in there, like chips or vegetables. Overall, this recipe is definitely a keeper. That’s all I have for today. Check back next time for another a recipe. I have a couple of more snack foods I just tried out that you may like to try and I do have some plans for a nice Valentine’s Day dinner involving some steak, lobster tails, a beet salad and molten lava cakes, so check back for those. Until next time, enjoy the rest of your day and enjoy your meal! Wow another winner. I think you have a great blog, it never fails to come through with fun and delicious recipes. Thanks! I really appreciate that. I like to make stuff that I think lots of people would want to try. By the way, I liked your spicy egg brunch; it looks delicious. Thank you, I was surprised at how good that egg dish was. I give my wife the credit for that one. If you try it let me know. I would love to know what you thought of it. I will definitely try yours. I am thinking about doing a post about all the great recipes I have found through the blogs I read.